The quest for the Super 510: It begins. 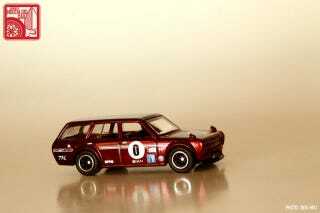 So like most of us, I struck out last Saturday on finding the $uper 510 wagon. (I was lucky to even find a mainline version) I must have missed it by just a few minutes, because they had just put out the cases, and it sucked. That was the one car I was determined on getting, and there were none to be found. But I'm not deterred, and I've vowed not to buy one of the ridiculously overpriced ones from some scalper on Ebay. So what am I gonna do now? The plan is to go to the Wallgreens down the street from me every day until I find it. They're running low on their current stock, so I figure they have to open a new case within the next few days. Couple that with the fact that most collectors would bypass the smaller selections in favor of Kmart or Toys R Us, and I may just have a chance of finding it. I will find the Super 510 or die trying.